The first week back in the office after the holidays was not typical this year. Our office was open Monday when most of our customers were not in the office which made for a nice catch up day. Unfortunately, I came back from vacation with a bad cold so wasn’t as productive as usual and then threw in the towel Tuesday so I could recover. Wednesday was jury duty day. Usually, I am not called for a jury so just spend 4-6 hours enjoying the free WiFi and catching up on reading or correspondence. This time I was sworn in on a jury that is still in progress. I’ll write more about this in the future but it’s been interesting. Before moving on to the great giveaways going on, I wanted to take a moment and thank the following sites for sending readers this way. These are the top 15 referrers to Bucksome Boomer in 2011. Check them out for great reading! Here are the giveaways I know about in the personal finance blogosphere. Master the Art of Saving (great title) is giving away a $25 Amazon gift card. Enter by January 20th. Are you a super fan? The College Investor has a $300 cash prize for his biggest fan. Enter throughout the month. DollarVersity has 3 copies of The Millionaire Next Door up for grabs. Entries close January 30th. Could you use personalized keychains with this giveaway at Maximizing Money. Get your comment in before January 31st. Out of Debt Again has an EasyAzon wordpress plugin giveaway. Enter by midnight January 12th. If you need motivation, enter a book giveaway for Millionaire Teacher: The Nine Rules of Wealth You Should Have Learned in School at Invest it Wisely. Entries to win one of five copies must be in by midnight January 14th. Face and Fitness is giving away winner’s choice of $50 PayPal cash or Amazon gift card. Enter by the end of the month. $100 cash is up for grabs at Budgeting in the Fun Stuff. Enter by end of day on January 25th. That’s the scoop for this week. See you tomorrow where I’ll share my goals for 2012 and want to hear about yours! You must be my jury duty twin! 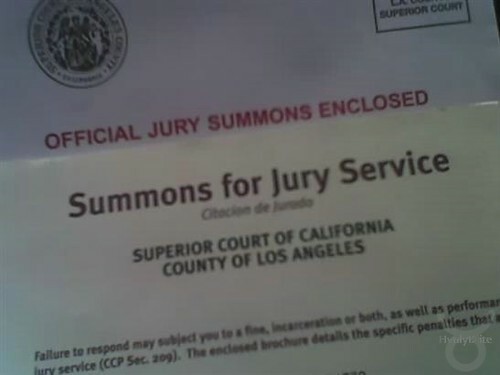 I just received my summons to be “on call” for the term starting later this month. I served on a jury about 3 years ago. It was a murder case and it was pretty interesting. So, I didn’t mind too much. But, again? Already? Oh well! Wow to a murder case. I really only wanted to serve a quick trial or loss of salary could become an issue. We’ll see how fast we can finish now that deliberations have started. Thanks for the inclusion, Kay! Interesting about the jury duty. That would be interesting to hear more about how that progresses. Thanks, it’s been interesting and I had a lot of misconceptions from watching TV and movies showing courtrooms. I’m sure I won’t be kept if I ever get called into jury duty. They don’t happen to be fond of ultra conservative people. Haha. Good luck with jury duty—let us know how it goes! Jon ultra-conservative and ultra-liberal people can serve as long as they agree to follow the law versus their opinion. Jury Duty…At our courtroom, they won’t let you use wi-fi, read a book, or newspaper or magazine while court is in session. You are supposed to be paying attention. The judge will call you out on it! That would be something if we could not pay attention during court. I meant while waiting to be called for a jury, I enjoyed the free WiFi. In court, we must be all ears and eyes on the session. Thank you very much for the mention of the giveaway. Appreciate the support. Previous post: A Roundup of Carnivals and Link Love!